A case of unfortunate timing almost prevented a destination wedding in San Diego from happening, but a group of strangers came together Monday to help pull off a last-minute ceremony. Gilbert and Margie were high school sweethearts in the Philippines who had reconnected via Facebook after 22 years apart. They decided that San Diego would be the perfect place to get married in front of friends and family. "It's a whirlwind romance for the two of them," said friend Frederick Abueg. "It's like magic for the two of them, you know?" Two days ago, just as loved ones from the Philippines arrived for the ceremony, Gilbert's appendix ruptured and he was rushed to Sharp Chula Vista Medical Center for emergency surgery. Jane, Margie's daughter, told 10News, "We thought we had to cancel it. We were all nervous." When hospital staff learned that the wedding was scheduled for Monday, they felt like they could not let Gilbert and Margie's wedding day pass. Staff members turned a room into a chapel, and others chipped in to help with the flowers, cake and Margie's hair. The stage was set for Gilbert and Margie to tie the knot. He was wheeled in for the ceremony, got to kiss his new bride and was able to cut the cake with Margie. 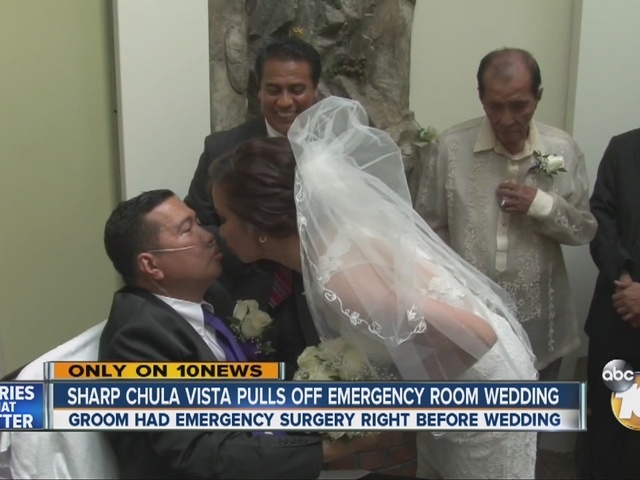 "It was beautiful to see everybody come together and help this couple," said Sharp Chula Vista chaplain Bogar Hernandez. After the ceremony, Margie said, "It's really a blessing to be with him … I'm really, really happy." Gilbert added that he too was "really happy." It was definitely a wedding to remember for Mr. and Mrs. San Diego. Margie said, "[I'm] the happiest lady in the world right now, that I'm exclusively 'Mrs. San Diego.' Finally!" Margie has lived in San Diego for several years, and her new husband will be moving to be with her when he is healthy. Doctors say Gilbert will probably be in the hospital for at least the next week.